The drawing illustrated here is 5"x7", on medium tooth sketch paper. It's drawn using Staedtler Mars Lumograph pencils, hardnesses, B, 3B, 5B, and 6B. Whether or not I use a reference photo, I always start by drawing an outline sketch of the subject and background (if any). 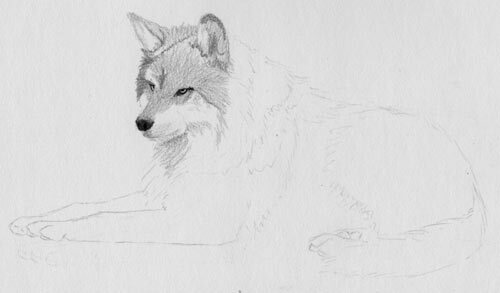 I try to give the overall outlines of form, the locations of important details like eyes, nose, ears, feet, etc., and provide an impression of fur contour, direction, and texture. I also try to give myself an idea of where color and shading transitions occur, although I am not altogether precise at this stage. Many of the internal lines will move as I draw the piece. I always start with the eyes and face of the subject. If a drawing has more than subject, I start with either the dominant or the most central subject on the paper. It is very important for me to plan out the flow of the drawing at this stage so I don’t end up smearing the art with my hand later. I have found that I am unable to keep a steady hand unless it is in direct contact with the drawing surface, so I tend to work in a circular pattern around the paper out from the face. 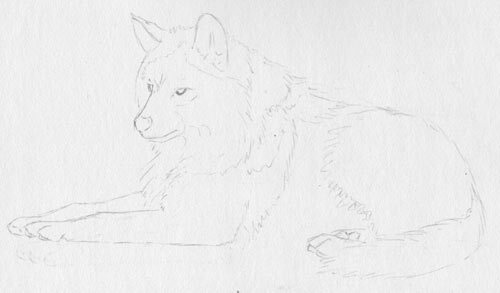 On a small piece like this one (5”x7”), I worked from the head, down the front, and then to the right since I am right-handed. I drew in the eyes first, with full detail, and the nose, both with a 5B pencil. I then switched to a B pencil and lightly drew in the base shading for the face. This layer of shading should be about the same lightness as the lightest tones in any given part of the texture. 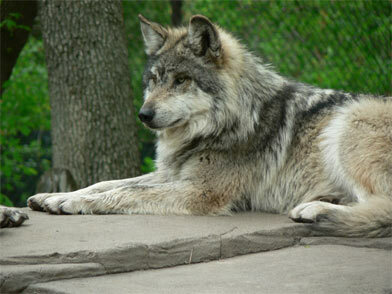 Look at the highlights of the fur texture, and draw in that shade. 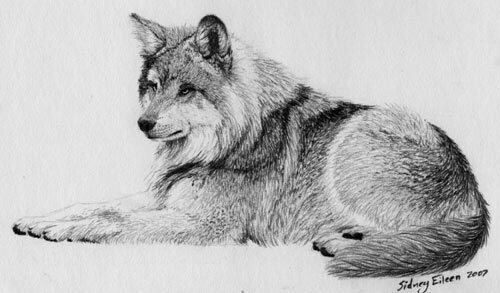 Be sure to draw the pencil strokes in the direction the fur flows. 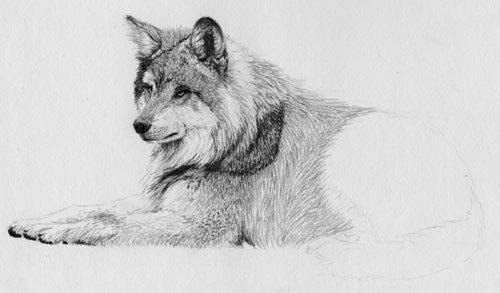 Those strokes will usually show through in the final picture, and help to define the overall texture of the fur. Stroke length is not important at this stage unless this layer of shading will be left uncovered in the final drawing. After the base shading is created, I continued with the 3B pencil. 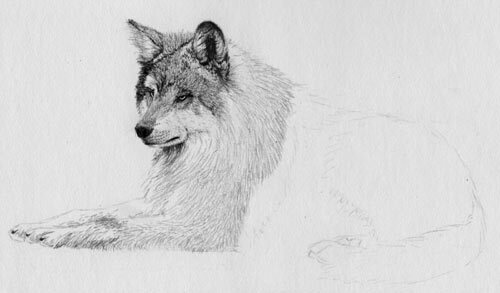 Applying a bit more pressure, and using more deliberate strokes, I start to create the texture in the fur. Try to keep the pencil as sharp as possible, and keep your stoke lengths to about equivalent of what is visible in the reference. At this stage you are filling in the median shading strokes. The darkest areas will be filled in over this. At this stage, some of the shading areas created in the first layer can still be changed. I decided at this point that the ears looked a little bit small, so I extended the shading areas and moved the placement of some of the details. After the median shading details are filled in, I switch to a 5B pencil. On larger pieces, I will also use 4B, but I have found that on small drawings such details are completely lost. Gently add a small amount of shading to areas that look a bit flat, but aren’t necessarily supposed to be dark. Each hardness of pencil has a different tone to it, and even a light application can provide a depth that a single pencil cannot. I did this on the top of the nose and around the eyes and muzzle. As with the first detail layer, keep your pencil as sharp as possible, and restrict your stroke lengths to what you see in the reference material. Always make your strokes in the direction of the fur growth. After filling in the shading details on the face, I switched back to a B pencil. Much of the area along the back of the head, around the neck, and the front legs, have bright white for the base color, so in those regions I use the pencil as a detail layer, using the color of the paper for the base shade. As I added the strokes, if I saw an area that didn’t need that white brightness, I very lightly rubbed the pencil stokes with my finger tip, creating a very gentle, slightly off-white base tone. As before, I went over the base shading with detail strokes in the 3B and 5B pencils. In this area I switched off between the two, moving around the entire region adding more details. I built up the details, slowly making them darker and darker until they matched the reference. 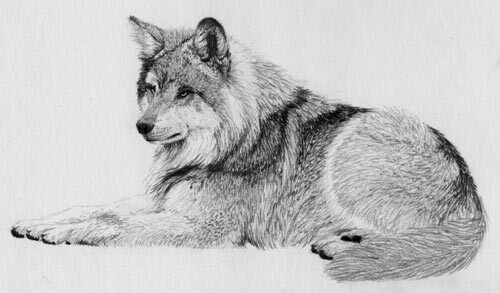 In the region around the elbow, I used extremely short, contrastingly dark strokes to create the impression that the fur is both rather short and pointing toward the viewer. A quick succession of compact, dark, ticks were all that was required. 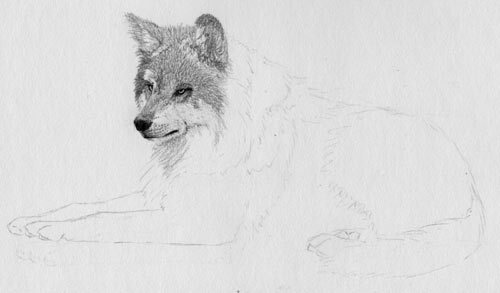 In the case of foreshortened fur, I will usually put in the darkest shade immediately after the base shade and then fill in any median shades. The shadows are so short that there is a lot of contrast. I filled in the pads of the feet with a 6B pencil so they would be as dark as possible. Continuing with the same techniques, I move on to the details of the torso region, and add base shading to the rear legs and tail. 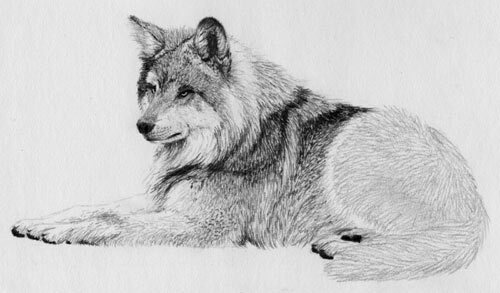 Added are the median shading details on the rear legs and tail, with some of the darker shading details to the very right of the drawing.